This week we have a review & giveaway of a perfect mystery for Halloween because it’s about chocolate! We also have a little Q and A with Colette. Details at the end of this post on how to enter to win a copy of The Semi-Sweet Hereafter. We also have a link to order it from Amazon, and from an indie bookstore where a portion goes to help support KRL. Chocolate Whisperer may be a made-up job title, but there’s nothing fictional about Hayden Mundy Moore’s expertise at perfecting all things chocolate. Her client list is discrete, but growing, with restaurants and businesses hiring her to improve their recipes and final products. Her latest assignment takes her to Sloane Square, London, where Hayden’s skills have been engaged to stop Primrose restaurant’s slow decline in quality. Hayden’s financial adviser Travis had specifically selected stuffy Old England as being the safest place on earth for her, but that plan quickly falls into disarray when Hayden discovers the body of her client’s ex-husband. She would not exactly call Primrose’s elitist owner Phoebe Wright a friend, but Hayden would never have wished this tragedy on the cooking-challenged aristocrat. Jeremy Wright was Britain’s sexiest celebrity chef, and his death has London’s notoriously aggressive tabloids intent on exploiting the story to its fullest. Never more than now does Hayden need her best friend and security expert Danny Jamieson, who immediately flies in to assist on break-ins, guard her back, and most importantly, prevent Hayden from being her impulsively helpful self. As someone who loves to see only the best in people, Hayden is balanced out by the cynical and distrustful Danny. Together they visit Jeremy’s hot and trendy restaurant, meet the personal trainer who forbids the consumption of chocolate, and are nearly drunk under the table by a ruthless agent and the assistant chef planning a Tell-all book. 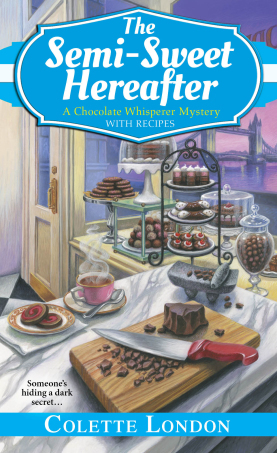 Along with mouth-watering descriptions of chocolate desserts and the best of London’s cuisine, this third in the Chocolate Whisperer Mystery series delves into the complicated and understated relationships between Hayley, Danny, and Travis. Hayley loves to provoke Travis over the phone, yet she has never met in person the man whose primary concern has always been her safety. Her friendship with Danny has remained steadfast despite their brief disastrous attempt at dating, and his distaste towards chocolate is something Hayley has taken on as a challenge. Less easy to overcome is Danny’s attitude towards the money she inherited from an uncle who wanted her to have the freedom to pursue her dreams. Irrepressible Hayley is a delightful heroine, and her resilience and sense of humor is constant without ever becoming cynical. The exploration of London, including their unique policing system, is the final detail that perfectly tops off this deliciously fun mystery. I’m Colette London, author of the Chocolate Whisperer series of cozy mysteries featuring globe-trotting chocolate expert and amateur sleuth! Hayden Mundy Moore. Hayden works as a freelance troubleshooter for chocolate companies, restaurateurs, and boutique chocolatiers traveling the world while turning “Okay” chocolates into “Wow!” chocolate extravaganzas. More often than she’d like, she stumbles onto murders. Fortunately, Hayden has an eye for detail, a network of helpful friends, and a knack for making people open up to her, so when the worst happens, Hayden is confident she can help track down the killer(s)…even if she’d rather be perfecting a killer chocolate cheesecake or baking an unforgettable triple-chocolate brownie. I make sure every book is intriguing, fun to read…and full of delicious recipes for treats like anytime chocolate chip cookies, can’t-miss hot-fudge sauce, and easy “You won’t believe it” chocolate mousse. By the time you’re finished reading, I hope you’ll be satisfied by the story and eager to try a mocha milkshake, peppermint truffle, or spoonful of homemade chocolate hazelnut spread. 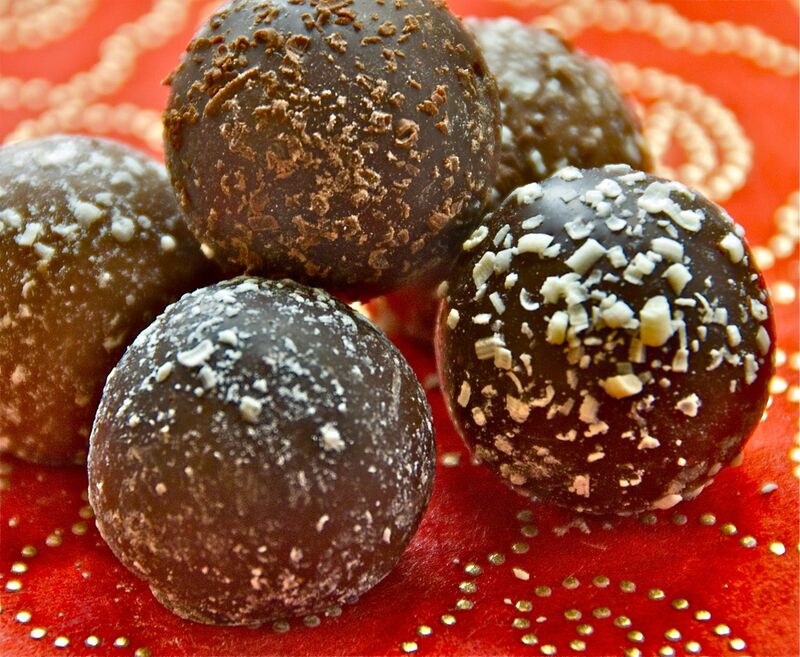 I’ve learned a lot about chocolate while writing the series, and I love to share. I’m fortunate enough to be doing something I love, so I write almost every day! I arrive in my office around 7 a.m. with a fresh cup of black coffee and a headful of ideas, turn off my internet connection, and just start typing. My first book was published in 1997. In the nineteen years or so since then, I’ve written in a variety of genres for multiple publishers. I’m so grateful to all my readers for letting me entertain them! At the moment, I work in a loft office at home, overlooking the green grass, blooming roses, and tall oak trees of the Pacific Northwest. When I’m not at home, I’m usually traveling. 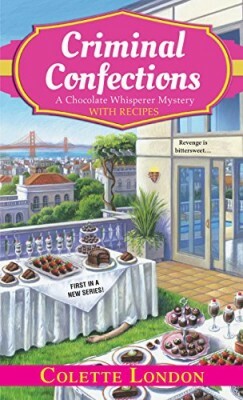 For Criminal Confections, the first book in my current series, I traveled along the California coast to San Francisco to research chocolate-making and resort spas. For Dangerously Dark, the second book in the series, I dug into the indie food-cart scene in “Foodlandia,” aka Portland, Oregon. For Semisweet Hereafter, the third book, I went to London and dreamed up ways that Hayden could become involved in the British chocolate scene. I can’t wait to share the resulting story! Why did you write the Chocolate Whisperer series? Well, it’s a nice excuse to think about chocolate all day! Also, getting to know Hayden and her friends, Danny and Travis, has been a blast. With every book, I discover more about the them. Plus, I have a great time coming up with compelling mysteries and interesting characters to populate them. From my perspective, and, I hope, my readers, it’s a win-win! If you’re the methodical type, you can start at the beginning with Criminal Confections, followed by Dangerously Dark. If not, feel free to jump right in to The Semi-Sweet Hereafter! All the books in the series stand alone, so they don’t have to be read in order. 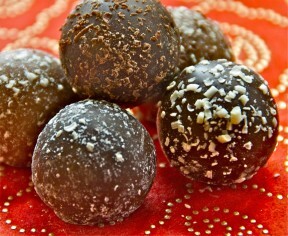 If you’re interested in chocolate recipes, be sure to visit colettelondon.com, where I share my favorites on the site and via social media. I’d love to connect with you! Colette London sometimes eats salad. She always eats chocolate. And she’d love for you to join her chocolate-loving community! If email isn’t your style, but you want to get new recipes and occasional book news, drop by her Facebook, Twitter, or Google+ pages right now. Let her know you came from this site, and she’ll send you a bonus recipe! P.S. Colette London is a pseudonym for a best-selling novelist who’s published more than three dozen books worldwide. Want to use your Google Fu to find out her secret identity? Nah. Don’t spoil the surprise. Use your powers for good and order The Semi-Sweet Hereafter instead! To enter to win a copy of The Semi-Sweet Hereafter, simply email KRL at krlcontests@gmail[dot]com by replacing the [dot] with a period, and with the subject line “hereafter,” or comment on this article. A winner will be chosen October 29, 2016. U.S. residents only. If entering via email please include your mailing address, and if via comment please include your email address. Oh! This does look like a fun read. Thank you for a wonderful post and the introduction to a new author and series. I do hope this will be a beginning to the series Thanks for the chance for an early start on it. This would be a new series to me. I do believe I need to check it out! Now — if the pages actually smelled like chocolate and there was a Hersey bar hidden in the back cover, all would be perfect!!! Thanks for introducing me to another must read author & series. I can’t wait to try some of those chocolate recipes, my 4 year old son wants to be a chocolatier when he grows up so we are always looking for fun new recipes. Oh I am almost drooling thinking about chocolate! What a delight it would be to read this!